Most of us like to eat, but where are we at in terms of our relationship with cooking? More importantly, do we really know why we eat? On the practical level, many people struggle to know how to cook and feel uncomfortable in the kitchen; or are cooking without an understanding of the basics – of the science that underpins and explains the process and art of cooking. Knowing what these basics are provide a solid foundation for understanding how cooking works and can go a long way to supporting you to cook with confidence. There is too an emotional aspect to our relationship with food and cooking, particularly when it comes to eating. Some struggle to know what to eat, or with their relationship with food overall, holding all kinds of ideals and beliefs – carry-overs from childhood – as well as the messages we absorb from society and the media. We can also use food for comfort, entertainment and indulgence, but is this its true purpose? Then there are those who work in kitchens. Many cooks and chefs come to the hospitality sector because they love food and cooking and serving others – only to find the reality of a commercial kitchen is far from what they envisaged. Others struggle with the long hours and hot, heavy work and experience a rise in stress and consequent decline in health. Victoria Lister is qualified and experienced chef who has spent a number of years as a chef, a food manufacturer and caterer. She combines her love and knowledge of food, cooking and kitchens with her understanding of the energetic principles that underpin life, health and well-being to support people in their relationship with food, cooking and kitchens in whatever way this takes place. “Food is there to support us and nourish us. Preparing food for ourselves and others is an act of love. When that is distorted, so too is our relationship with food and all it entails”. My partner and I recently did a cooking ‘intensive' in Brisbane with Victoria Lister. The idea was to hone our culinary skills and repertoire through the hands-on preparation and cooking of a meal for eight people – we all shared the meal at the end of the day. It truly was a delightful and highly informative series of sessions. Victoria is a master of detail and I particularly loved learning to multi-task and co-ordinate so all the dishes came ‘home’ as a unified and beautifully presented meal. The whole was day was characterised by such a sense of fun and it really did give me a new reference point to build on, namely, cooking can be engaging and enjoyable and when this energy is present the food gains a whole new dimension. Cooking as a ‘have to’ is so yesterday. Cooking with Victoria is an enjoyable way to learn new cooking skills and enhance any you may already have. Although I have been cooking for more than fifty years, I learned something new that day! With her meticulous attention to detail, culinary skills honed with years of professional chefing and a real love of simple, good food, Victoria is an expert guide and teacher. We also had a lot of fun in our session and got to eat everything we had prepared – a definite bonus. A few days later at home, putting into practice what we had learned, we produced a delicious tagine for a dinner party which was enthusiastically received. Have a cooking session with Victoria if you want an easy and engaging way to learn how to cook, upgrade your existing cooking skills or simply cook something different. 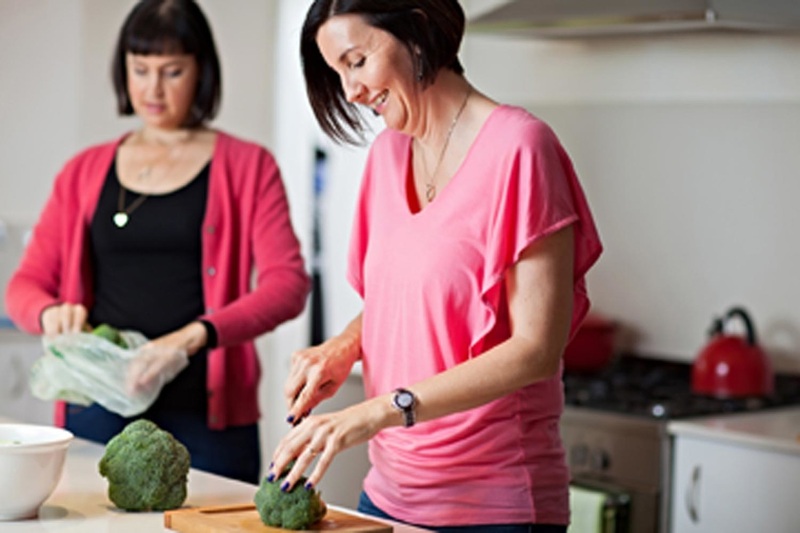 It is a productive, fun and fruitful way to spend a few hours with someone who is skilled in the art of all things food from meal planning and shopping to an absolutely delicious end result that looks and tastes equally good. I felt very cared for with a session that was individually tailored to my needs. Thank you.